Best mates Johnno and Spanner share a deep bond. Now on the cusp of adulthood, life is destined to take them in different directions – Johnno's family are moving him to a new town and a better life, leaving Spanner behind to face a precarious future. In pursuit of adventure and escape the boys head out on one last night together and go to an illegal rave before parting ways indefinitely. Beats is directed by Scottish filmmaker Brian Welsh, director of the films Kin, In Our Name, and The Rack Pack previously, as well as a few TV mini-series. The screenplay is written by Kieran Hurley and Brian Welsh; based on a play by Kieran Hurley. Executive produced by Steven Soderbergh, Leslie Finlay, Peter Hampden, Scott Meek, and Norman Merry; produced by Camilla Bray. This premiered at the Rotterdam and Slamdance Film Festivals earlier this year. 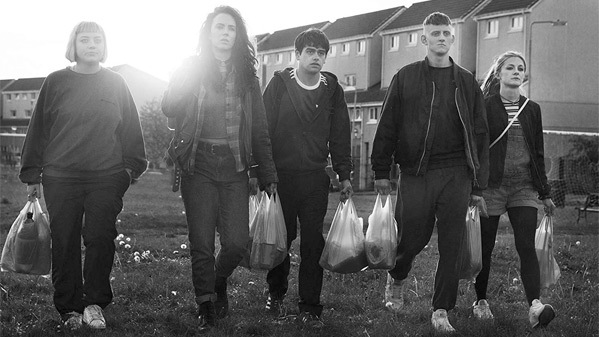 Altitude will release Welsh's Beats in UK theaters starting May 17th. No US release is set.